Last night was date night! Yay! Once a week the kiddos stay at their grand parents. I think I have said this before, seriously the greatest thing about us being in Mauritius, is the proximity of husband’s parents! I have never had the luxury of having family nearby to look after the kiddos – and as much as I love my children and I spend all my time with them, when they are not at school and they want me – it is nice to have an adult evening with my (better?) at least other half. However, it is not because of that, that we manage to go out and eat once a week, actually I think it was several months ago since we did it last. Husband decided to treat me to the best and finest Indian cuisine on the east coast, namely Amari by Vineet at Lux Belle Mare. 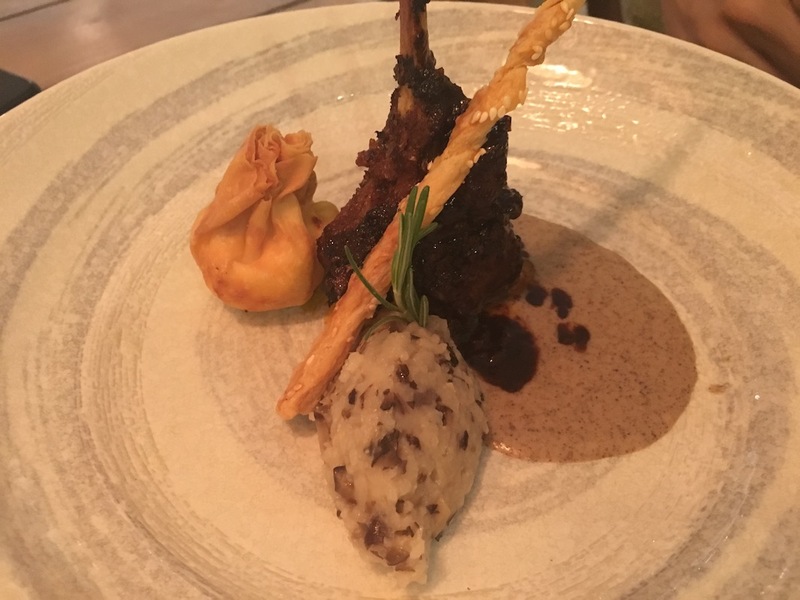 Vineet is a Michelin Starred Chef – his home restaurant is in London and he has over the years offered consultancies and his name to restaurants in Geneva, Dubai, Qatar or at Lux Belle Mare, here in Mauritius – just to name a few. We have never stayed at Lux Belle Mare, the feel of the hotel is nice (I think their F&B options are great) however, the rooms lack of privacy for me, when you walk by, you can look directly into the rooms. It is however the best hotel in Belle Mare on trip advisor and Lux is a very popular brand in Mauritius. 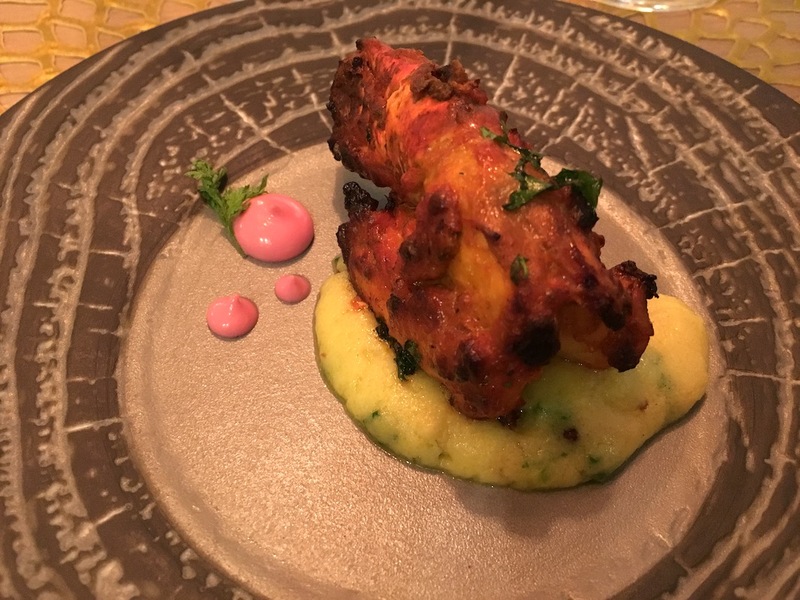 Amari by Vineet is definitely a treat! I really enjoy my evening. You are met by the host who greets you and gives you a Bindi on your forehead – that cute little red dot you see Indian ladies with. The restaurant is not particularly big, but they amazing outdoor space, for the summer. We sat upstairs this time which I prefer – maybe less cosy, but airier and their is an open (but windowed) kitchen where you can see the chefs preparing some of the food. I took the pictures as we were leaving, the restaurant was more than half full when we arrived. Tourists tend to eat pretty early in this season – I guess it is because the sun sets around 6pm! The food. Yum! All our dishes were well balanced, not too big and simply delicious. The tandoori prawn as starter was well cooked. The chicken we had as second starter was just so moist and tasty and the lamb we had as main was juicy and the curry made with coffee went so well with it. 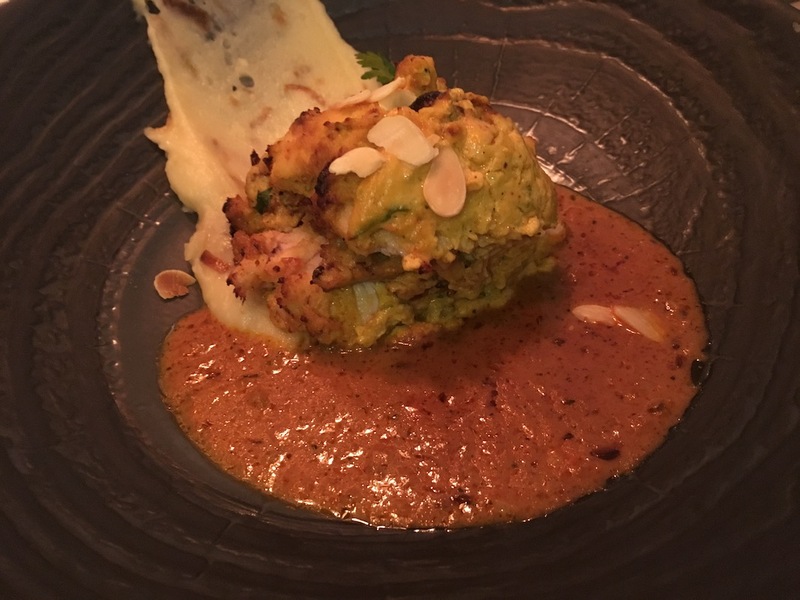 It is not like your traditional chicken korma or other curries here, this is really a more refined Indian kitchen. Oh I forget the naan! Crispy and light – and the garlic naan, just delicious. I usually don’t drink cocktails but their cocktails menu was very intriguing. 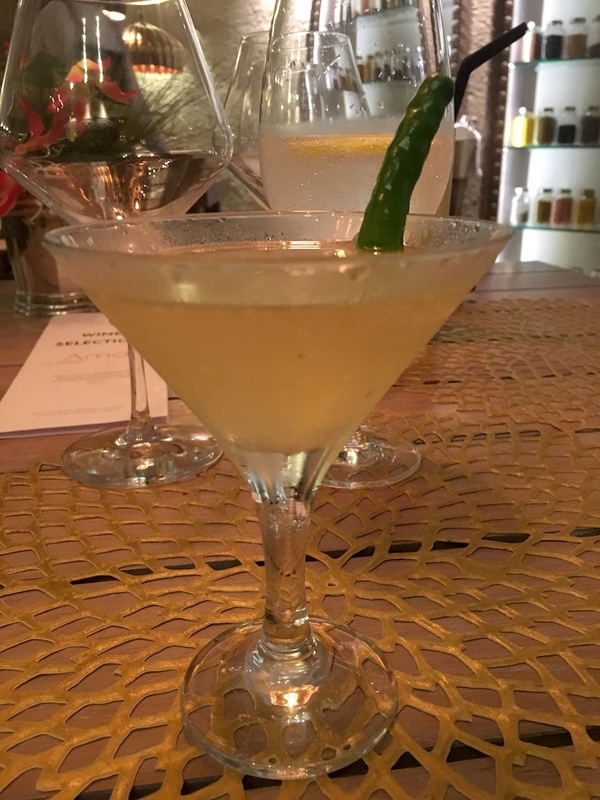 Samyaki Sip is a gin cocktail, with mainly cucumber liqueur. Now when I first tasted it, I thought nice but not really me. It is a bit sweet for my taste. But here is the trick, when I had it with my food, I was blown away by how well it went with the spices. I could have (and should have) continued through the meal with it. I had a glass of Merlot, which also went well with the lamb, but my guess is that my little cheeky cocktail would have done a better job. To end the evening: a little sweet thing. We had 2 deserts to share, both very nice – but a bit much for us – one would have been fine. 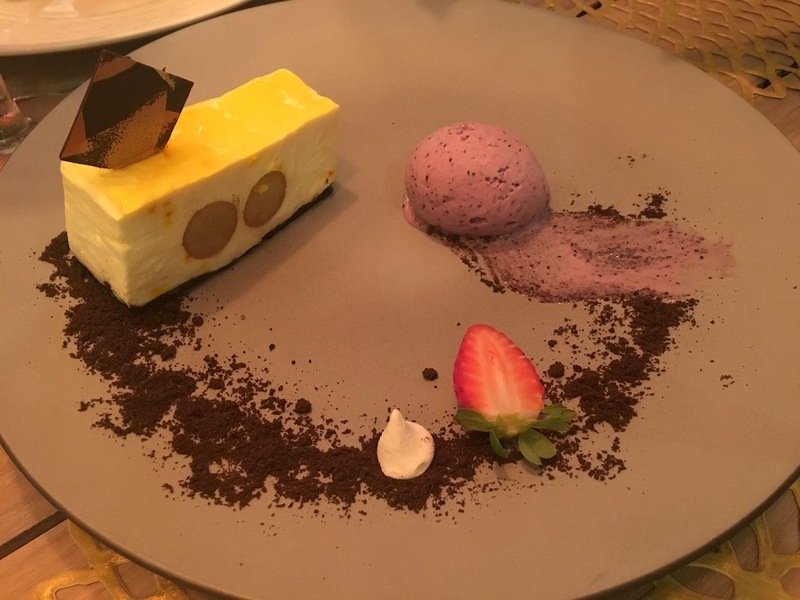 The first was a saffron cheesecake, with a kind of dry rasmalai ball inside – I am not a cheesecake person, but this was not too sweet and the saffron taste was awesome. 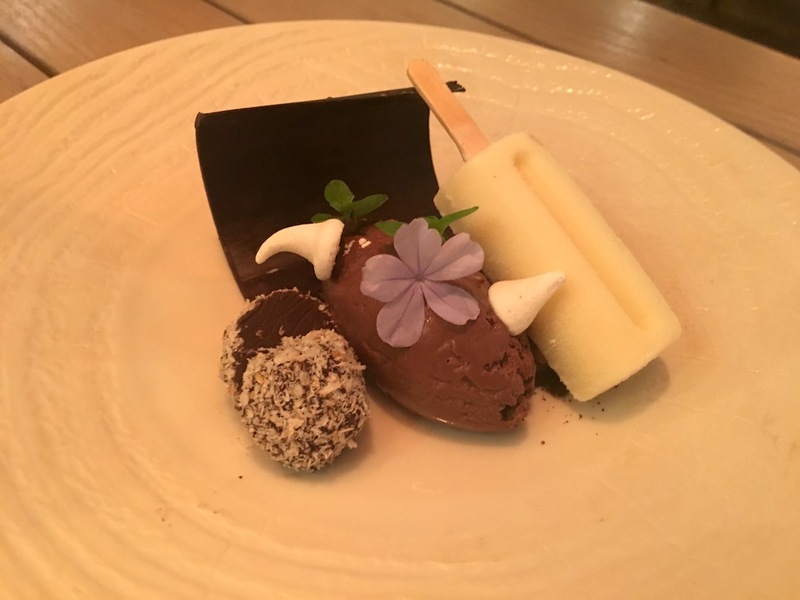 The second was a chocolate mousse, deep and full of flavour, accompanied by a lavender kulfi type of ice cream. Both desert were great. A beautiful evening, with yummy food! The hotel is really nice to have a walk in. There was a live band at the bar as we were leaving. Perfect place for a date night. And the food looks yummy! ! You had such a wonderful time! Happy for you. Date nights are important for the health of the relationship.